There's that great speech at the end of Ratatouille where the restaurant critic Anton Ego -- who's had his icy heart thawed by a well-executed mesh of eggplants, peppers, and herbes de Provence -- notes that while not everyone can cook, a great chef can be anyone and come from anywhere. That's more or less true about webcomics. The Internet allows unprecedented access to webcomic creators, meaning webcomickers can come from anywhere and webcomics can be about anything. But not just anyone is going to become a successful webcomic creator. Even accounting for different definitions of success, successful webcomicking takes resolve, hard work, luck, and maybe even a smidgen of talent. Plenty of comickers have have offered blanket advice to aspiring comic creators that can't be dismissed: draw everyday, don't fear failure, connect with other creators. But that's very different from creators actually reflecting on their experiences. Fortunately, the world wide web has gifted us with two multi-part columns on webcomics: Brad Guigar's "Ten Years of Webcomics" and Sam Costello's "On My Own in Independent Comics." It's worth checking out both as Guiger and Costello are in such different places in their webcomics lives. 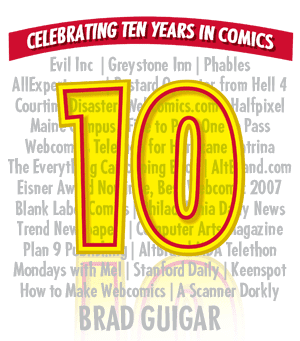 Guigar, who created Greystone Inn, Evil Inc., Phables, and Courting Disaster, is one of the more venerable forces in webcomics. He's seen the rise and fall of Keenspot, founded Blank Label Comics, written a book on making webcomics , and had his strips published in newspapers. Costello, by contrast, is a relative newbie to the webcomics scene. Where Greystone Inn and Evil Inc. are both long-form, syndication-style strips, Costello's comic Split Lip is an anthology that's more comic book than comic strip. And, while Split Lip does have two print volumes to its name, Costello is still an amateur in the literal sense of the world. Split Lip doesn't make him any significant amount of money -- in fact, it costs him quite a bit to operate. Perhaps most significantly, unlike most webcomickers, Costello isn't a cartoonist. He scripts the individual stories and hires artists to illustrate them (incidentally, someone will have to explain to me why Argentina has more cartoonists-for-hire per capita than anyplace else). Guigar's column is, appropriately, more of a reflection on his career in webcomics -- and by extension, the history of webcomics. He talks about working with different webcomics collectives, his decision to try different kinds of comics projects, podcasting, charitable work, and setting up Webcomics.com. Costello's column is geared more directly at his fellow neophyte cartoonists, outlining his personal victories and stumbles, discussing his writing regime, and revealing his bottom line (As I'm learning from personal experience, paying artists per page adds up. Oof.). I also woke up this morning to see DJ Coffman (Hero By Night, Yirmumah) plugging his ebook Cash for Cartoonists, which promises to teach cartoonists the $ecret$ of making the big bucks. I suppose the fact that I'm familiar with Coffman largely because an acquaintance hired him to draw the pitch pages for her comic says something about his money making powers, but the book costs forty-seven freaking dollars (for an ebook no less! ), and his pitch reminds me of all those "make money from home" listings I keep flagging on Craigslist. It's going to take more than a few testimonials to shovel off the pound of salt that comes with those claims. Thank you for this guidance.its really informative for all iginversiones..